It is no secret that I have a sweet tooth. 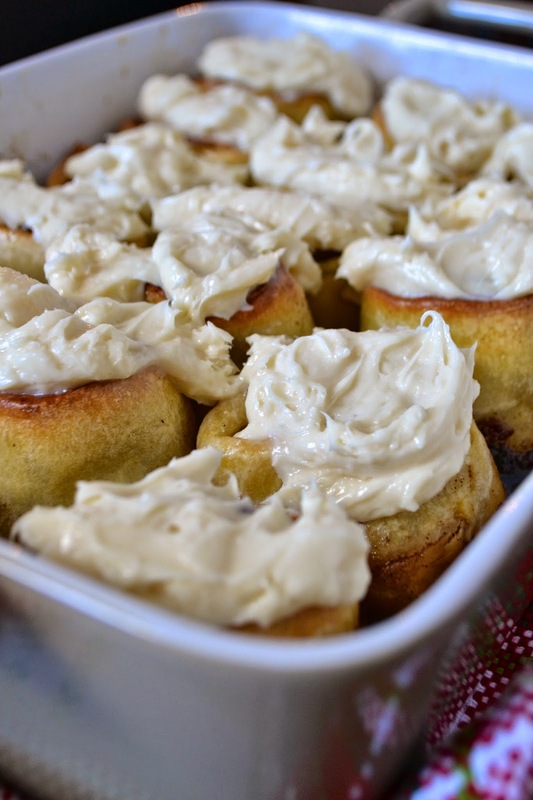 I have seen dozens of cinnamon roll recipes out there but never convinced myself that I had a good reason to make a batch until this holiday season. Warm, gooey, and decadent, with the wonderful fragrance of cinnamon and sugar filling your home, why wouldn't you want to make a pan?! I prepared these beauties the night before, so all I had to do in the morning was bring them to room temperature, bake, frost and consume! Recipe makes 16 rolls and is slightly adapted from Williams-Sonoma Taste. To make the dough, in the bowl of an electric stand mixer, dissolve the yeast in the warm milk and let stand until foamy, about 10 minutes. Add the granulated sugar, eggs, the 4½ cups flour and the salt. Attach the dough hook and knead on low speed, until the ingredients come together. Toss in the butter and continue to knead until the dough is smooth and springy, about 7 minutes. Lightly oil a large bowl. Form the dough into a ball, put it in the oiled bowl and cover the bowl with plastic wrap. Let the dough rise at room temperature until doubled in volume, 1½ to 2 hours. Butter a 9x13" baking dish. Punch down the dough and turn it out onto a lightly floured work surface. Cut the dough in half. Roll out 1 dough half into a rectangle about 9x14". 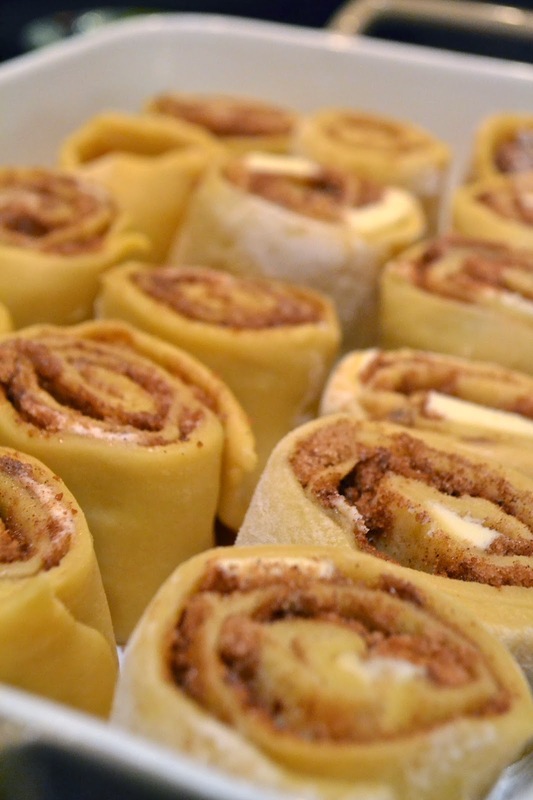 Spread with half of the butter, then sprinkle evenly with half of the brown sugar and half of the cinnamon. Starting at the long side closest to you, roll the rectangle away from you, forming a log. Cut the log crosswise into 8 equal slices. Arrange the slices, cut side down, in half of the prepared pan. Repeat with the remaining dough and filling ingredients, and arrange the slices in the other half of the pan. Cover the pan loosely with plastic wrap and let stand in a warm, draft-free spot until puffy, about 1 hour, or refrigerate overnight, then let stand at room temperature for 30 to 60 minutes before baking. Preheat an oven to 400°F. Brush the rolls lightly with the beaten egg mixture. Bake until the rolls are golden brown and a toothpick inserted into the center of a roll comes out clean, 20 to 25 minutes. Meanwhile, make the cream cheese frosting: In the bowl of an electric mixer fitted with the flat beater, combine the cream cheese, butter and vanilla and beat on medium-high speed until light and fluffy, about 2 minutes. Gradually beat in the confectioners’ sugar and continue to beat until thoroughly combined, stopping the mixer to scrape down the sides of the bowl as needed. If the consistency is too soft, refrigerate the frosting until it is spreadable, about 15 minutes. Transfer the pan with the rolls to a wire rack and let cool slightly, then spread the rolls with the frosting while they are still warm. Pull the rolls apart and serve warm. Enjoy!